Flavia has been busy being fabulous this past weekend, but I wanted to follow through on her comment about the spelling bee protesters, to remark how the protests held yearly at the national bee relate to disputes about spelling in early modern England. The demonstrators outside the Washington Grand Hyatt represent the Simplified Spelling Society, which campaigns to replace our current orthography (or "right writing") with a strict phonetically-based spelling system (gotta luv the placards: "Enuf is enuf!" "Spelling shuud be lojical"). 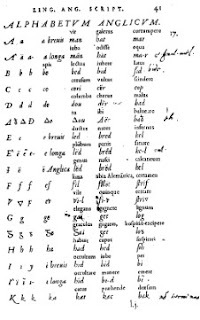 Promoting what it calls "the alphabetic principle," the society echoes several sixteenth-century humanists, such as Thomas Smith, John Hart, and William Bullokar, who sought either to amend or to replace the Roman alphabet we use with an alphabet in which each letter designates one, and only one, English speech sound. Far out, huh? Suffice to say that these early spelling protesters were unsuccessful, at least in reforming a scheme defined by systemic variation (i.e., we still spell some words phonetically, some according to etymology, some language of origin, etc.). Where these reformers were successful, however, and why we owe to them the present-day spelling bee -- where their phonic-hooked descendants get their annual fix -- was in promoting the idea that everyone should conform to the same spelling. I have written how a spelling bee is only competitive, or suspenseful, when systemic irregularity is the rule, not the exception. Even more fundamentally, however, a spelling bee requires consensus that there are "correct" and "incorrect" spellings, and that correct spelling -- being a "good speller" -- is admirable and worthy of public reward. As these humanists sought for their crude and unruly language the rule and regularity of classical Latin and Greek, they saw an opportunity to distinguish themselves by making a contest out of correct spelling. Somewhere along the line, though -- well, the lines got crossed, as reciting the letters of orthographically complex, even dubious, words became the index of mastery in the mother tongue, and parrotting the standard spelling of obscure terms became a mark of distinction and exceptionality. (It's a paradox, no doubt, though one we rarely think about; rather, we tend to displace our discomfiture at this sociolinguistic oddity on to the spelling bee contestants themselves . . . ) Historically speaking, the ends of humanist spelling reform, to advance to higher rounds of social status via language, far outlived its initial phonetic means, indeed "the alphabetic principle" (ding!). Instead, as the reformers' newfangled alphabets gave way to other innovations, spelling reform inadvertently generated the texts we now regard (and admire) as the repositories of standard English. Realizing that noone would use his reformed orthography unless taught, John Hart writes what is arguably the first English textbook, A methode, or comfortable beginning for all unlearned, whereby they may bee taught to read English (1570; still, noone really buys it, except for one fabulous exception, Thomas Whythorne, who writes his autobiography in Hart's orthography; now there's a read!). Other schoolmasters object to the prospect of a new English alphabet, but see in English pedagogy -- that is, in the process of teaching English as a subject of learning (it had been known chiefly as a "mother" tongue, learned at home) -- a means to teach "uniform," or correct, English, indeed (chiefly) English spelling. Writing his Elementarie (1582), Richard Mulcaster additionally proposes a book in which extant spellings could be "fixed," both corrected and stabilized, in print. Reprinted this year (yep, that's 2007!) by U of Chicago P, and reviewed here in Inside Higher Ed, Robert Cawdrey's A Table Alphabeticall (1604) usually gets the credit as the "first English dictionary," but this title is misleading. First, foreign language dictionaries -- i.e., Latin-English, French-English, etc. -- had been in print for some time, for the benefit of enterprising humanists and courtiers traveling abroad to the continent. Attempting to "define" "hard wordes in plaine English," Cawdrey's volume takes the model of the foreign language dictionaries, but applies it to the vernacular -- i.e., yielding an English-English dictionary -- effectively suggesting through translation how "learned" English comprises a second, or foreign, language. More than 20 years earlier, however, Mulcaster had printed a list of words expressly for the purpose of establishing the correct, or standard, spelling. Having printed what amounts to a "reference text," Mulcaster and his Elementarie get my humble nod for the "first dictionary." Feel "crucified" by English spelling? You should, if you're not mixing with the right crowd. (Again, with the Life of Brian: "Crucifixion or pardon?" "Pardon. . . nah, just kidding, crucifixion!") For Gill and other early English language zealots, the criminality of these "wandering vagabonds" lies as much in their deviation from legal codes as in their presumption to devise their own code of language. Make no mistake, Gill protests how "that detestable scum," in developing their own argot, filch humanists’ (newly acquired) jurisdiction in English. With dictionaries now in print on everything from unix code to classic rock, we are accustomed to the idea that dictionaries translate arcane jargon into "other words" used more commonly in English. (See Bryan Curtis's piece in Slate on a recent variation of the "cant dictionary," Randy Kearse's Street Talk (2007), which Kearse wrote while in prison.) What endures in this conceit is the notion that there are "correct" and "incorrect" usages, that there's such a thing as right and wrong, and that there are stakes in choosing to conform and/or deviate (interestingly, I just learned that Richard Rorty has died: RIP, great pragmatist, and condolences to his friends, family, and followers). What also endures is the competition among social groups to determine what qualifies as "correct" -- indeed, dems be da stakes, and it's in this light that we might view the Simplified Spelling Society (which bears the most unfortunate of acronyms; were ya thinkin about the letters there?). That is, by privileging their spelling system over that now in use, the, er, SSS proposes to challenge not only the ortho-lexicographic powers that be(e) -- aka Merriam-Webster, McGraw-Hill, etc. -- but also a society that, having deferred to humanist innovation in language, has publicly consented to the importance of correct spelling, enough to yearly, if often satirically, admire and reward it. With that offhand gesture, I conclude this year's series of posts related to this year's bee. (See you next year? Dunno.) I welcome the new readers who have come here as a result of this year's competition, and especially welcome their forthright expertise; by all means, stick around, keep me honest! (If my blog were a bee, I wouldn't have made it into the second round . . . ding! ding! ding!). I would be lying, however, if I did not confess some distress, and not a little hand-wringing, over the considerable traffic (we're talking thousands at this point) generated by searches for Evan O'Dorney and autism. At first I was mystified, as the number of inquiries (and visitors) progressively increased while the bee itself began to recede. Conducting a few searches of my own, however, I realized that Evan's post-bee appearances (on CNN, the Today Show, the Jimmy Kimmel Show, etc.) prompted the surge. I've been dismayed by the tenor of discussion on some of the online message boards. The venomous ignorance, about everything from spelling to autism to home schooling to, well, basic facts about adolescence, is enough to make you want to ferry your kids to a deserted island, far far far from the madding crowd. I'm grateful that none of that intemperance has appeared here, though, just as I was concerned about the propriety of my initial remarks, I have since worried that what I wrote functioned to fan the flames, by making a further spectacle of this impressive, though vulnerable (and who isn't at 13? ), young man. Now as ever, I wish Evan O'Dorney and his family all the best for the future, and, without getting too preachy (believe me, I know I tend to the ponderous! ), I hope that this site has offered those searching, whether "neurotypical" or somewhere "on the spectrum," some resources for further research and reflection. Next up (in no particular order): Horace's compendium of advice for grad students; my tales of Toronto and Montreal; decisions about Jardiniere (ach, I think I'll just do my gardening bit here); and I suppose I should say something about Sgt. Pepper . . .
Glad to see you included "the canters' dictionaries," Gwynn. I'm so tired of Ben Johnson and the 18th century getting credit for inventing the dictionary. Your entry inspired me to start digging through my dusty, musty grad school files in search of my photocopies of Thomas Harman's CAVEAT OR WARENING, FOR COMMEN CURSETORS VULGARLY CALLED VAGABONES (1567). Because I teach freshman composition nine months of the year, I really relish summer months like these when I can read your blog and re-enter the wonderfully archane, yet timely, world of Renaisssance literature. Thanks for sharing your witty wisdom! You're on my list. . . so looking forward to reconnecting. . .